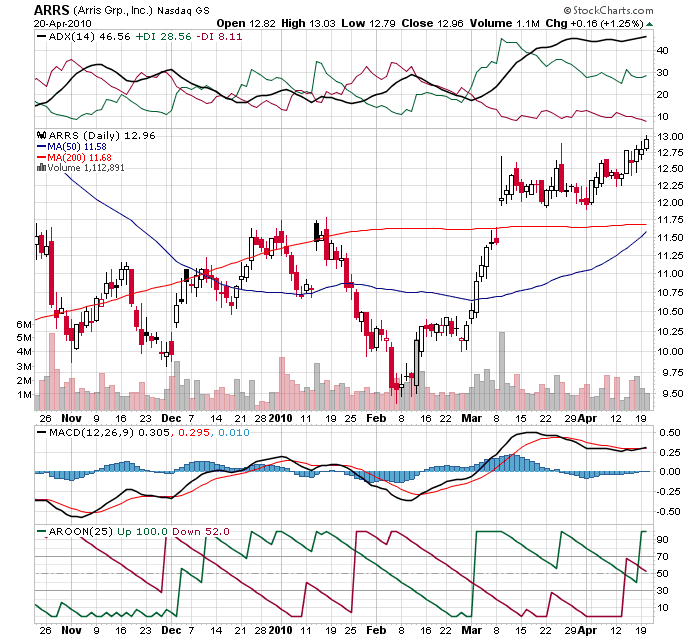 Since I like to highlight tech stocks when I can, today I'll take a closer look at Arris Group. 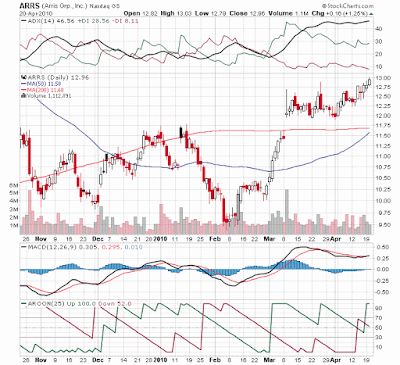 Wilder's DMI and Aroon are clearly bullish and MACD looks like it's moving in a bullish direction again. Te 50-day moving average headed upward and is close to a bullish crossover above the 200-day moving average. Arris is a global communications technology company specializing in the design, engineering and supply of broadband services for residential and business customers around the world. The company supplies broadband operators with the tools and platforms they need to deliver reliable telephony, demand driven video, next-generation advertising and high-speed data services. ARRIS products expand and help grow network capacity with access and outside plant construction equipment, reliably deliver voice, video and data services and assure optimal service delivery for end customers. All of these measures show Arris to be well within value territory. But this is a tech stock; can they show growth? The following chart shows the financials over the last five quarters. Q4 of 2009 showed a nice sequential increase in both revenue and net income. That performance was driven by the move to high speed cable modems. Time Warner Cable and Comcast (CMCSA) increased their business offerings through Arris which is a major provider of the latest DOCSIS 3.0 technology which supports higher broadband speeds up to 100 Mbps. Cable operators like Comcast and Time Warner Cable (TWC) are now offering these higher broadband speeds through Arris modems. I suspect this trend to higher speeds has legs. Arris is about to release results for the first quarter of 2010. Seeing how the stock is advancing, it appears that many investors are expecting good things from them. On the other hand, there have been some mixed analyst opinions. In March, Needham and Company upgraded Arris while Zacks downgraded Arris based on management's indication that sales towards its biggest customer, Comcast Corp., will decline in 2010 compared to the previous year. Zacks is not convinced sales to Time Warner Cable will more than make up for the decline at Comcast. Needham thinks the Comcast issue is overblown and that Arris will find success with a new product roadmap in the area of IP set-top boxes (Moxi) and SMB access equipment as new engines of growth. On April 27 we will see Arris Group's earnings report for the first quarter of 2010. Even at current levels, the stock still shows value so I would think that, short of a really disappointing earnings announcement, the risk is minimal while the potential for growth is solid. This could be a good stock to keep on your watch list.